B U B B L E G A R M: Blogging IS the new media! I couldn't agree more. I honestly trust real woman (aka beauty bloggers ) over beauty editors because real woman who blog are going to tell you the trust, the real facts and the good/bad/ugly. Beauty editors usually just tell about the good. I don't want to know just about the good... I want to know what DOESN'T work as well. I have learned so many things from beauty bloggers and have found so many cool products. I love seeing real woman wearing the product I am researching and how it worked for them. Seeing it on someones skin vs just a picture of the product is 10 times more helpful. I tagged you in my first award give away... check out the link lovely ! I absolutely agree! That "article" was so infuriating! If we are not professionals, that doesn't mean we don;t try out the products, work with them, and see how they treat our features? Completely ridiculous. Wasn't there a beauty journalist who recently slammed bloggers? Completely out of order, I LOVE the fact that bloggers actually give their own opinion as opposed to being paid to only give positive opinions. Great post! Great idea! I posted yesterday saying, I'm a beauty blogger hear me roar. Let's celebrate the positives and how great our COMMUNITY is. I will add this for sure!! I completely agree! I trust the opinion of beauty bloggers far more, you get to hear the bad as well as the good. The beauty community is something pretty special I think. People holding giveaways and sending lovely things to someone that you've never met before is amazing. We do it because we love it, and that's all that matters. I went over to see THAT article again am suprised by the latest comments that have been added, but ho hum they are entitled to their opinion and we are entitled to ours! I totally agree, putting the lovely badge/sticker on my blog. 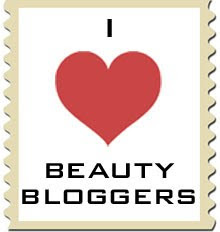 I totally agree with you!Great post, I put the stamp on my blog!Yeah for beauty bloggers! I agree ,I love reading other bloggers blog and i must say alot of my fav products are from reading fellow bloggers blog ,ill always love beauty blogs. How can I add it? lol & I totally agree, this is my hobby and therapy. I would much rather read a review from a beauty blogger than an online magazine's (who is paid and sponsored). Am adding this stamp to my blog! Hello there...not all bloggers are honest, like you...and I actually trust your reviews, and you give your opinion on cheaper products as well, not just Nars, YSL,blah-blah etc. I appreciate your honesty, but I feel that not all the reviews I find on the Blogs are true ...that's just me. Brilliant post! Until I started blogging etc, I never realised how much more I'm influenced by what the bloggers say. There is a place for beauty editors but all products have a head start when used by these 'professionals' who probably have perfect skin, hair etc due to the fact that they have been testing/using 'creme de la creme' products for years. What works for them may not work for somebody without such a track record. Now I just need to try and add this stamp to my blog! Well said. Your badge is going in my sidebar now, thanks! Here here!!! We totally agree!! Awesome post and I decided to write a post. I'll add this image for sure! I completely agree with yours and the above opinions. The way I see it, we're like a consumers' association and we're just trying to watch out for each other. Journalists and companies should remember we are the customer. I'll be adding this stamp to my blog immediately. I agree with you! Adding this to my blog right now! Great blog btw! Couldn't have put it better myself! Blogging has opened me up to new possibilities, new brands and products and has allowed me to enter the most amazing blogosphere of lovely beauty bloggers!